Tiger Woods says Augusta National's decision to lengthen its course has narrowed the list of potential winners at this year's Masters. "With the length some of the guys hit the ball, they are having a hard time holding the greens," he said. "Those shorter hitters are going to struggle." But veteran Gary Player defended the changes, which affect six of the holes. "There have been a lot of criticisms, but I think unjustly so, now I've played it," said the 70-year-old. Another 155 yards have been added to the course this year, making it the second longest in major history at 7,445 yards. Woods was particularly unhappy about alterations to the seventh hole and the par-three fourth, which now measures a massive 240 yards. "I didn't think you needed to mess with the fourth. It was cool as it was," he said. "I thought the seventh was a really great risk-reward hole where you could hit driver or you could hit an iron off the tee," said Woods. "Now it's playing totally differently." Woods, who is usually keen to avoid controversy, is the latest in a long list of former champions to question the changes. Last month, six-times winner Jack Nicklaus accused Augusta National of "ruining" the course, while Nick Faldo said the extra yardage makes it impossible for him to win a fourth Masters title. "I can't compete on a course like this," said the Englishman. "But fortunately I have three jackets in the locker room." Faldo is particularly unimpressed by changes to the 11th, the scene of his play-off victories in both 1989 and 1990. The tee has gone back 15 yards, making it a monster 505-yard par four, while trees have been added down the right and the fairway moved left. "I think the change to the tee shot is a little heavy-handed," said Faldo. "The change is dramatic. It's not the same by miles. It's a shame. But Player, who had criticised the changes in the build-up to the tournament, said on Wednesday that he had changed his mind. "I was brainwashed about how abnormal it was," said the South African legend, who aims to play two more Masters so he can break the record for the most appearances. "It's not abnormal. The guys are basically having to hit the same second shots that Jack Nicklaus had to hit (in his prime)." 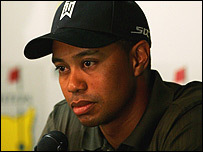 And Augusta National chairman Hootie Johnson was unmoved by criticism of the changes. "We are comfortable with what we are doing with the golf course," he said.